This week our bird watchers had an unlikely visitor at the Dry Tortugas National Park. The cold-weather Razorbill showed up unexpectedly and brought many smiles to the faces of our surprised birders. We were all in awe while witnessing this beautiful penguin-like waterbird swimming and diving for fish at the park. It was truly a remarkable experience for all. This large auk of the northern Atlantic Ocean seemed somewhat out of place in South Florida. Usually they can be found offshore in winter only as far south as New Jersey and occasionally in Virginia. According to the experts, this bird will mostly stay between Maine and New Jersey preferring to breed in Iceland, so to spot one more than a thousand miles from its usual habitat is considered most improbable. Only a couple of years ago have wildlife specialists even seen a Razorbill in this area of South Florida. Heavy rains and tortuous hurricane winds were said to be one of the main causes for these birds showing up in Southwest Florida and in their exhausted and starving state. This attracted not only the many bird watchers to the area, but also the speculation as to why they were here. The stout-bodied Razorbill is a medium-sized waterbird sharing its tuxedo color-scheme with the penguin. It is a light bird weighing only 17 to 31 ounces and measuring up to about 17 inches with a wingspan of around 26 inches. Its unusual shaped black bill is round tipped and stout and resembles an old-fashioned razor, which would probably account for it being named "Razorbill." Being a colonial seabird, the Razorbill only comes to land to breed. During this time, both parents share responsibility in protecting the nest which is usually situated on coastal cliffs that are safe from predators. The nesting consists of a shallow bowl of pebbles, feathers, bones, vegetation, and shells, and placed in open spaces between boulders, in cracks in caves, rocks, or on narrow cliff ledges. The female often will choose her mate only after encouraging a type of competition between the potential suitors. Once this happens, the final selection is made, and the two will remain partners and stay together for life. The female lays only one egg per year. Both parents spend equal time incubating, and after the egg has hatched, both of the parents take turns searching for food for their young and will often have to fly long distances before finding any. Their food consists of fish, crustaceans, herring and other invertebrates. This species prefers living in cold oceans and will 'fly' underwater in pursuit of their fishy prey. And unlike its twin, the Penguin, this auk can fly in the air as well. 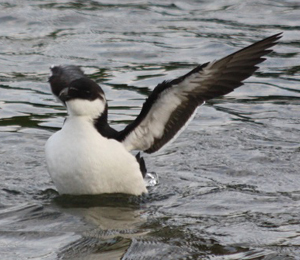 It was a treat to have such a distinguished guest as the Razorbill visit our park. The Razorbill is among the most beautiful and elegant of all birds, and some amazing and rare photographs were captured this week. All in all, it was a very successful, satisfying, and fun-filled week.